Wir benutzen Cookies, um dir das bestmögliche Erlebnis auf unserer Webseite zu bieten. Benutze die Webseite weiterhin wie gewohnt, wenn du damit einverstanden bist oder lies unsere Cookie-Bestimmungen. EMU Australia’s waterproof boots for kids and teens come in a great range of different colors, styles and sizes. 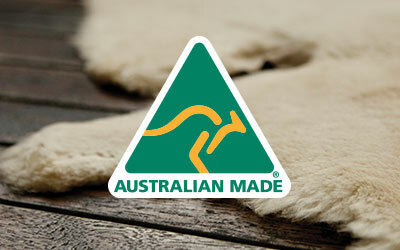 We have our classic Brumby Lo sheepskin boot in so many different colors, including black, blue, charcoal and khaki. Or maybe the child in your life would like something more glam, in which case go for our Roadside Teens style which has a very slight heel and lined with jersey knit wool, or styles with striking features like buckles and lace up details. We even have cute prints within the waterproof category. The kids in your life may want to only wear the trendiest and most fashionable boots, but we know we need to keep little feet warm and toasty and the same time. With EMU Australia’s range of waterproof boots for children, you can find practical and stylish sheepskin and leather boots, sure to keep small feet dry in the drizzle. Children and teens can stay stylish and warm in wet weather with EMU Australia. Our 100% real Australian sheepskin is naturally water resistant, and some of our products are also fully waterproof, and you’ll find those styles here. Whether the kids are braving the school walk in the ice and snow in the winter, or having weekend adventures with their friends on a drizzly summer’s day, we have just the boot for all occasions. Our comfy, but trendy and fashionable waterproof boots come in a range of options, including waterproof sheepskin outers, leather and suede, as well as a range of warm and cozy linings, such as jersey knit, fleece, shearling and 100% Australian Merino wool. At EMU Australia we have a range of cute and trendy styles for children and teens. Opt for the Roadside Teens biker boot style for edgy chic, whilst keeping practicality and warmth in mind. Or the Pioneer Teens style is a cool take on the chelsea boot, ideal for school as it’s fashionable but durable and practical. We offer boots with cool lace up details, and boots with edgy buckle details, as well as our classic sheepskin Lo boot styles in a variety of colors and even some cute prints. 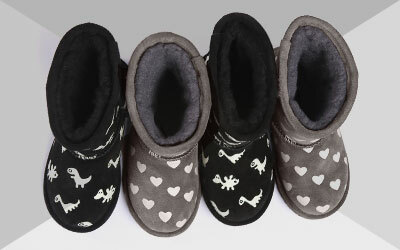 Whichever style you choose, you can be sure their feet will stay toasty warm and dry. The materials we use are natural, and the 100% real Australian sheepskin we use is not only amazing for keeping feet warm and dry in the winter, it’s also super breathable and wicks away moisture, meaning it also keeps feet cool and dry in the summer, making a pair of EMU Australia waterproof boots a great investment for the kids.